Ulrich Zwingli (1484-1531) was a Zürich priest and preacher who became the principal leader of an evangelical faction that quickly gained control of the city government. Celebrated as the chief reformer of Protestant Switzerland, he engaged in a long doctrinal dispute with Luther and his disciples over the Real Presence of Christ at the Lord’s Supper. Accordingly, Zwingli is considered one of the earliest leaders of the strain of Protestantism known as “Reformed” or “Calvinist,” after John Calvin, the Geneva reformer. 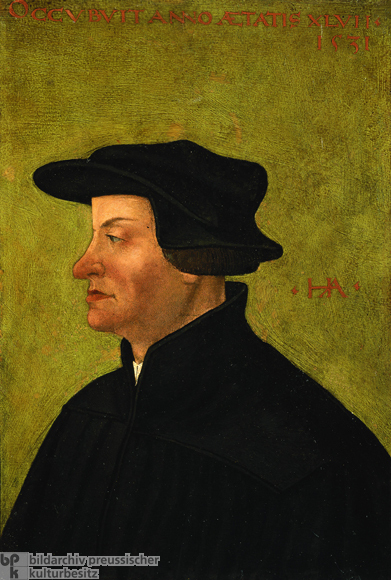 This portrait was painted after Zwingli died at the hands of Catholic forces during the Second Kappel War. Oil painting by Hans Asper, c. 1531.